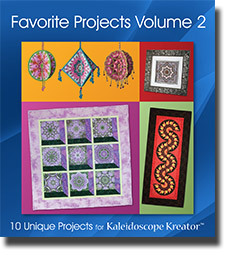 Our Favorite Projects Volume 2 contains fully illustrated, step-by-step instructions for ten fun quilting and sewing projects using Kaleidoscope Kreator 3. Projects include quilts, table runners, fabric ornaments, home accents, artwork and more! All project sheets are in PDF format for easy printing.